Welcome to the first installment of EdelHay year-in-review, following the worldwide adventures of Jordan and Alex. This year we bring you thrills, spills, and more life-changing events than you can shake a stick at. On August 21st, 2005, we were married in a verdant garden under the warm sun, with our friends as witnesses. We wept as we read the vows we had written. The whole weekend will live on in stories and images for years to come. Thank you to everybody who were able to attend. The first few days at home were very emotional as we acclimatized to our commitment, our future, and the heft of our rings. Relive the glory of our wedding at our wedding blog. In April we headed to Europe for some fun in the sun. Well, maybe not sun, but it was fun nonetheless. We started with a few days in Dublin, nestled in the corners of pubs and museums. 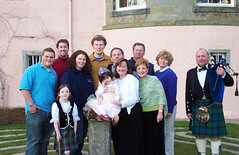 Then we met up with the rest of the Hay clan in Edinburgh, the starting point for our Highland adventure. We rented out the lovely pink Jacobite Castle of Park, near the Spey river. In addition to being a great location to base day trips from, this is also the region where the most Scotch is made and coincidentally where the Hays lived until they emmigrated from Fochabers, Scotland to Miramichi, Nova Scotia in 1784. We visited the ruins of Old Slains, the original seat of Clan Hay, perched precipitously on Cruden Bay. To get there we had to navigate the rental vans through muddy farmland, seemingly undriveable if not for our determination. Oh, and it was on private property. The farmer who helped us said in a thick Scottish accent: "Go this way, down the hill, and when you think you're about to drive into the sea, you're there." There the wind whipped between our ribs as we took in the views and the ancient rubble. From there we visited New Slains, then Fochabers, then Delgatie, each looking increasingly more castle-like and habitable. Despite the cold weather, rain, and darkness, Scotland shines with a rugged beauty. After Scotland, we dug in for more hard work at our respective jobs. Jordan was promoted and took a new job as the senior manager of "Ordering Experience" at Amazon.com. She manages the technology teams which make Amazon's critical ordering systems do what they do best: take the money. Alex continued to build Findory's traffic and user base, highlighted by the geek milestone of getting mentioned on Slashdot. Alex got more serious about fencing this year. In July, he competed in his first World Cup tournament in Vancouver, facing off against opponents from as far away as Japan, and beating them! Alex placed 32nd and achieved his first world ranking. In 2006 Alex will compete in Houston, Las Vegas, Vancouver, and perhaps Sacramento and Atlanta. After the wedding, we did what many freshly-married couples do: we went to Hawaii! For 10 days we snorkeled with brightly-colored fish and Honu (green sea turtle), avoided the unyielding sun, ate some of the best sushi of our lives, and learned all about volcanos. It was the perfect place to unwind after all the hubbub with the wedding. In fall, Alex turned 30, then bid a fond farewell to Findory. The 14 months spent there were fun, challenging, and a great learning experience. Alex landed a great new job as a senior software engineer at the Internet Movie Database, aka IMDb. IMDb has been a fixture on the internet for 15 years (longer than the world wide web), and has an authoritative database of information about damn near every movie ever made. With over a billion page views a month, IMDb is quite a large business, yet it is run by a small team of enthusiastic geeks. It's the perfect environment for Alex to continue to build his technology career. While Alex got settled in at IMDb, Jordan embarked on Q4 at Amazon.com, during which everybody shops and the ordering systems are under tremendous load. She was in "the war room" every day from dawn to dusk, keeping the site up for all those shoppers. It was a stressful but rewarding experience. For Thanksgiving, we continued the tradition of bringing up Alex's mom Babette and her beau Terry to Anacortes for the long weekend. No fewer than 13 people descended upon Hay Mountain for their fill of turkey, wine, and football. But wait, there's more! This year we traded our holiday pine tree for a palm as Jordan and Alex and Fred and Kathleen flew to Costa Rica for the week between Christmas and New Years. Meeting up with the Ellis clan, we spent a week hiking, birding, crocodiling (is that a word? ), and partaking of the local pool bar. Check out Alex's photos of the crew and of the flora and fauna. Well, that's just about does it for 2005. Have a healthy new year and we hope to see you soon! This year brought many changes for our friends and family: Owen and Amy got engaged while on a romantic trip to Peru and are actively planning their wedding for fall 2006. Marcia and Rob also got engaged this fall. The eerie thing is, both Amy and Marcia caught Jordan's bouquet at our wedding! Speaking of weddings, Todd Herlitz married Rebecca this spring, and Guido and Laurel tied the knot in November. A little further down the road of life, our good friends Christy and Kevin welcomed their son Zachary into the world. Zach attended our wedding, sorta. Lauri and Nok had their second, Abby, who was also (sorta) at our wedding. Last but not least, Jen Williams graduated from nursing school, and Kim and Hui San are bidding farewell to New York and and will move to Seattle in a few months.